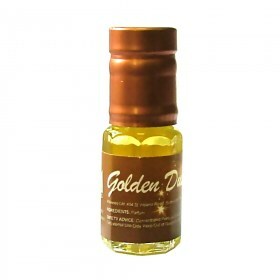 Golden Dust perfume oil for men and women. The Al Aneeq branded Golden Dust perfume is sure to please those that like a bit of musk and fragrances that are strong enough to overpower other odour in its vicinity. A very exotic oil, that's sweet, fruity and uplifting to the soul and mind. Musk perfumes or attars are the most popular in the Middle East and Asia..
Fragrances smell different on certain peoples skin because of skin chemistry and other factors. We advise all our customers to test the perfume first before applying on skin to smell the original scent profile, using a scent strip or an unscented tissue. If you have dry skin, your perfume will last longer if you moisturise it frequently. Remember, the warmer your body temperature, the quicker your fragrance will evaporate. This perfume can also be applied on clothing that do not stain, instead of applying on skin. This perfume is a unique Al Aneeq branded product and is in no way the same as any other perfume by the same name. Like most well known high street brands we use a mix of natural and synthetic (for stability, longevity & quality fragrance) ingredients for all our perfumes. Free from GMO plants, ethyl alcohol and animal ingredients. The 3ml/10ml perfumes come with a roll-on applicator. The first picture shows the 10ml bottle, the second picture with the bronze cap shows the 3ml bottle. Reaction or irritation to perfume oils are very rare; however, please take the necessary precautions. Do not use if you have sensitive skin or are allergic to any of the ingredients below. Do not apply to the neck & facial area, to cut or broken skin, to open wounds, or to skin with any kind of condition. Do not apply to clothing that stain easily. Keep out of reach of children. For external use only. Keep out of direct sunlight, away from direct flame and store in a cool, dry place. This perfume is just beautiful, it smells like pure heaven if there is a heaven. The fragrance lasts forever, It's a beautiful musky smell but has fruity high notes, along with a twist of an exotic Middle East of Asia smell. It's wonderful, I could never be without it. I highly recommend this exotic oil to everyone! Thank you Al Aneeq. ?